Posted by Bahrom in Endangered Languages, Linguistics, Tajikistan, Yaghnobi. The Yaghnobi language is classified as endangered in the UNESCO Red Book of endangered languages. However, an SIL team who conducted a survey of the Yaghnobi language during 2003 and 2004 (Paul, et. al. 2005) concluded that the ethnolinguistic vitality of the Yaghnobi language is strong. Why the differing assessments? Posted by Bahrom in Linguistics, Yaghnobi. Is there a “correct” English way to spell Yaghnobi? 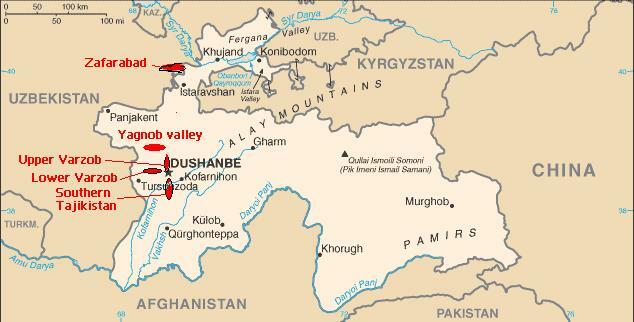 (The name Yaghnobi comes from Yaghnob, the name of both the river, and river valley in north-western Tajikistan that is the traditional home of the Yaghnobipeople.) I have been spelling the name with “gh”, representing a voiced velar fricative, because it reflects the way Yaghnobisactually pronounce the name of their language. However, it seems that in English, the spelling with “g” is more common. Perhaps this is because the modern English language (at least American English) does not have a “gh” sound.